NOTE: I phoned Peter Jacques number yesterday and left my name and phone number and that I was calling regarding “conflict of interest” but he failed to return my call. 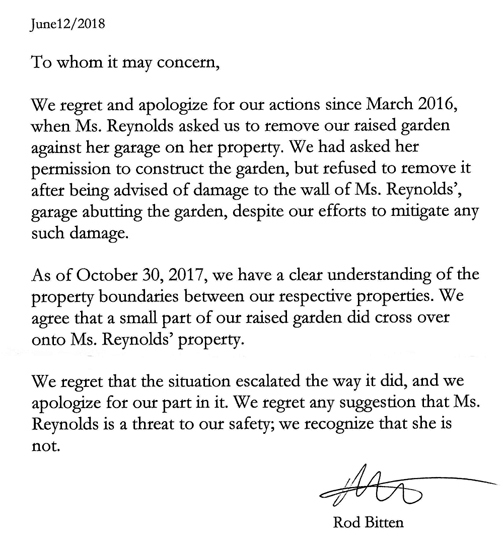 Since today is the election for the 2 Trustee positions with 4 candidates running for those spots I’d like to point out that if the 2 who put their signatures on the letter below are in fact elected, they will be required to recuse themselves from any discussions involving 34083 Yukon Inc., aka Kensington Island Properties. They have shot themselves in the foot by publicly siding with the developer, championing his cause with local MLA Don McRae and Peter Fassbender, Minister of Community, Sport and Cultural Development in Victoria. They have discussed a new piece of land at no cost to the landowners. 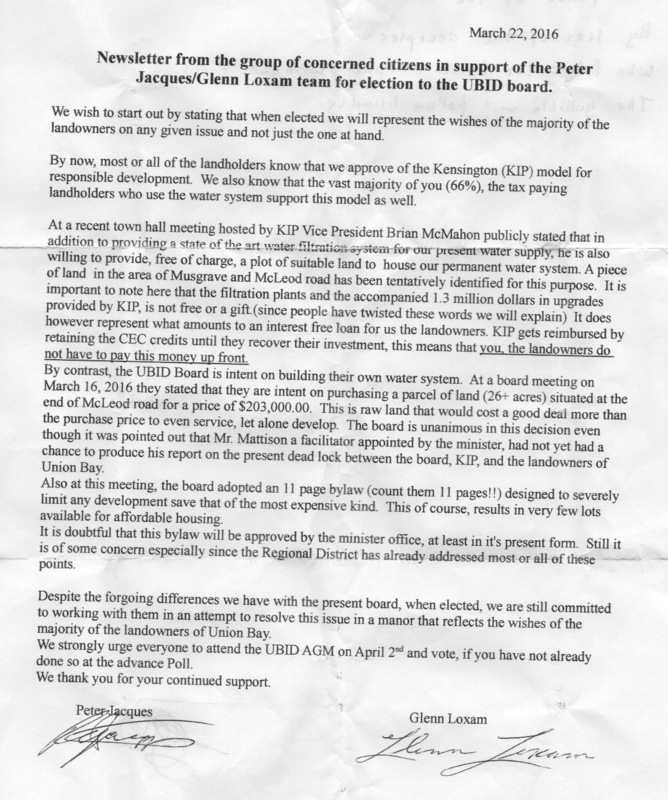 The audio of the March 14, 2016 meeting hosted by 34083 Yukon Inc. is evidence provided by the developer regarding the meeting on his behalf. These two have based their campaign on one issue – the expired Water Infrastructure Agreement with KIP. They have not mentioned any other issue or complaint regarding the present Board. The only thing they want is to agree with 34083 Yukon Inc. offers. They have already made up their minds as to the location of any treatment plant (without any reports) and claim it is state of the art but have they seen any drawings or are they just mouthpieces for 34083 Yukon Inc.? Only in Union Bay would someone try to pull this type of crap. Manor? It is claimed that over 60% of the landowners signed the petition (albeit taking only one property owner signature for each property) . If the vote taken yesterday is any indication of the support for the petition the successful candidates got about 53% of the votes.